After a bit of research into the sitter above, it quickly became clear that he was an engineer with the 1st Gas and Flame Regiment, previously the 30th Engineer Regiment. As a Private with the regiment, he would’ve been involved in the maintenance and mobilization of Livens gas projectors during the last several months of the war. Born on April 21st of 1897 in Naples Italy, Louis emigrated to the United States on May 26th, 1910 in hopes of linking up with family members in Pennsylvania. He gained his citizenship when he was naturalized in May of 1928 due to his service for the U.S. during the war. The men of the 1st Gas and Flame would be charged with maintaining, resupplying and moving the Liven’s projectors during the tail end of the war. What did this involve? Louis is sporting a wound chevron in the portrait photo above – he was gassed on November 1st, 1918 only ten days before the Armistice of November 11th. It’s unclear through the records on how he received his gas wounds, but it’s highly probable that his gassing took place during the Meuse-Argonne Offensive, when the 1st Gas Regiment was actively moving forward during the “third-phase” of the offensive. The attack in which Louis was wounded began at 5:30 on the morning of the 1st of November. Sadly, the gas mortars that were projected that morning were done so under less-than-ideal conditions and it appears that shifting wind blew toxic gas back towards the 1st Gas Regiment. All those who were gassed during this event were brought off the line to Sommerance, France where they were treated. All of this information can be found in the unit history of the 1st Gas Regiment, which is hyperlinked here. What Louis achieved after the war is unknown to me, but I hope that he lived a full and rewarding life. His war record and portrait will remain a part of my website, but I hope to pass the photo along to a relative one day. The bulk of my collection has been culled from endless pages of ebay listings, but I occasionally have the opportunity to discover hidden gems at flea markets and trade shows. Today I attended a Antiquarian Book and Ephemera show at the Sheraton in South Burlington, VT. I attached a link below to help plug this great organization. Anyway, I eagerly searched through thousands of postcards and photos looking for military related images. 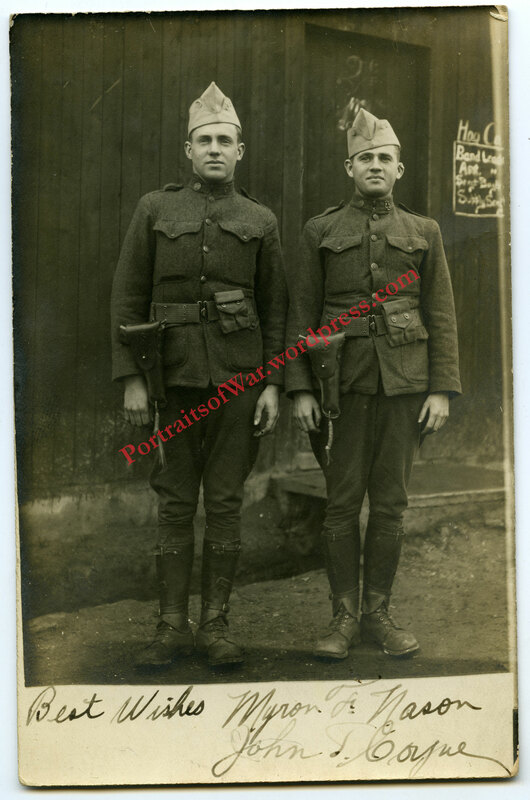 I saw a few overprices Civil War images, and a number of lack luster WWII photos. My WWI radar was in full swing and I left with a handful of great images. Please enjoy reading about my favorite find! 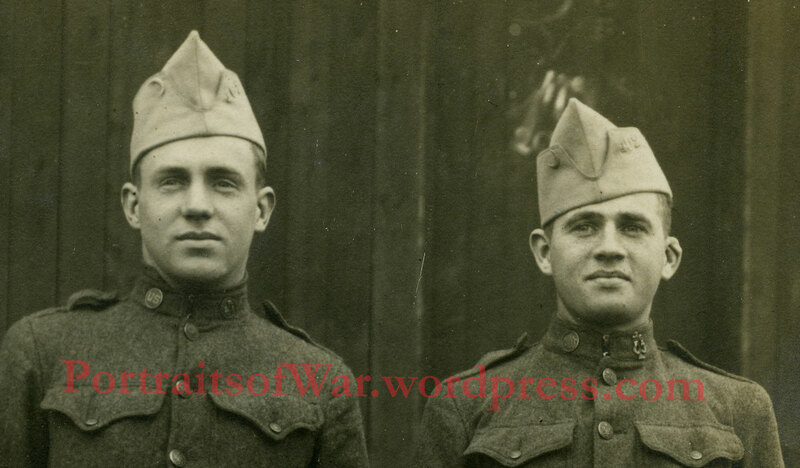 This wonderful image depicts two band members of the 102nd Field Artillery of the 26th Division. Taken in France in 1918, this RPPC (real photo postcard) has everything going for it. 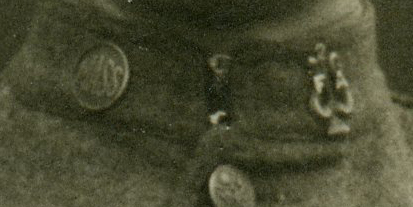 The two doughboys are wearing French style caps with unit designation affixed. Their collar discs are a mix of MASS National Guard insignia and 102nd Field Artillery band discs. The details on the M1911 pistol grips is superb. 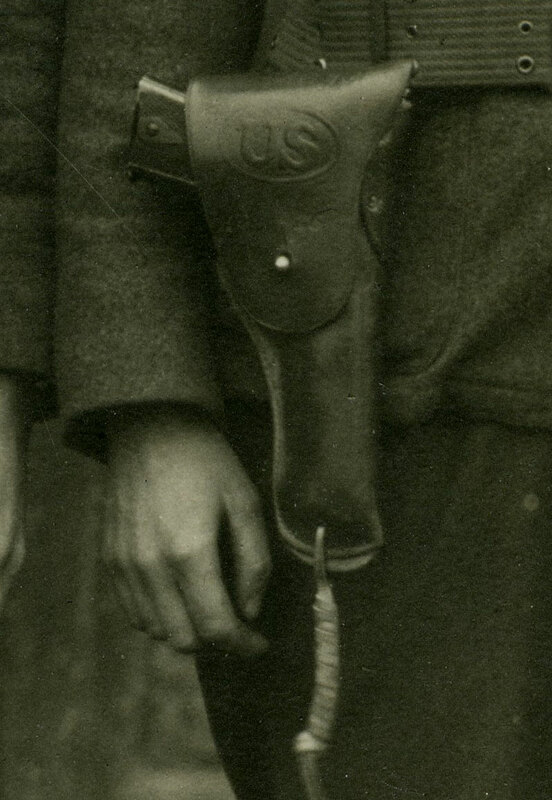 Even the embossed leather US is visible on the holster.